Hi Stephen, OK followed your instructions and got it all installed. All OK except I hear no audio. I found the instructions easy enough to follow. Well done. I installed the 3rd party software. Maybe something has hijacked the audio. I'll load some music tomorrow and have another fiddle around. Does the audio appear to be playing (as in does the volume meter light up etc)? If so it might be a hardware problem. I sometimes find cards that have some channels muted in ALSA on first install. Run alsamixer in the terminal and check everything is unmuted and turned up. The audio appears to play. The audio meters don't light up but the count up and time remaining tick over. The green pye chart is in motion and counts the last 15 seconds. I ran the alsamixer. A few items were off. I tried to fix it but didn't really know what I was doing even though I Googled and followed some instructions. I installed an extra sound card. I had read pulseaudio hijacks the system and needs disabling. The end result of this is the computer wont reboot. That's ok I'll do a re install tomorrow. All good practice. 🙂 I can't remember how many times I had to re install XP. I need to add that the audio worked ok in the other applications included with Xubuntu. Only Rivendell was silent. If you have a look in RDAdmin>Manage Hosts>Edit>Audio resources and scroll down to Audio Adapters. Card 0 should be ALSA. If it doesn't list ALSA at all in the list of cards then try running "sudo rdalsaconfig" in a terminal and make sure at least one of the available entries is in the active box. You might need a reboot after this. Thanks Stephen. All working. Great stuff! That's my wife in the photo, not me. The audio problem was. There are two sound sources. Audio on motherboard plus a sound card. Rivendell wont play off the motherboard. The other audio devices in Xubuntu do. 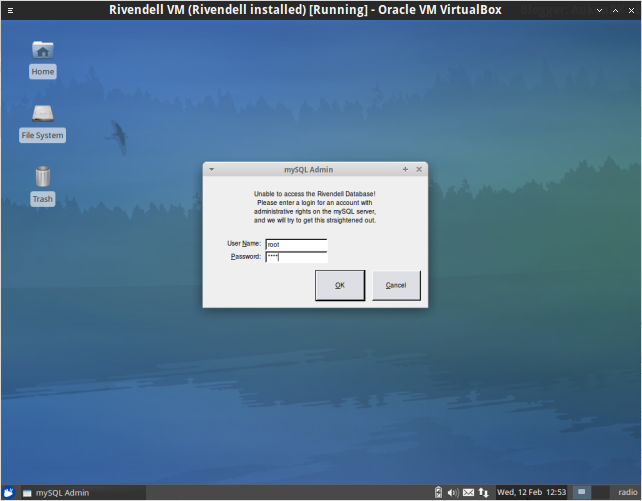 The second time I did a reinstall it picked up the soundcard which Rivendell can use. However. Today when I booted up Alsa had jumped back to the motherboard so Rivendell was once more silent. I was able to fix it by running sudo rdalsaconfig and activating the sound card. Quite simple in the end. Thanks for your help and looking forward to your 'Jack' set up. Glad to hear it Owen! Jack setup should be this week. Thanks for the tutorial. I was up and running in no time. However, I can't seem to change drives that I want to use for the audio files. The system drive is only an 80G and the external that I would like to use is 500G. How do I tell RD to use the other hard drive? Thanks. I would make a symbolic link. I haven't got a working Rivendell setup right now so I can't test for you. It looks like you're trying to install on a later version of Ubuntu than 12.04 as the qt3 libraries were dropped since then. Go back to step 2 and change the word "precise" to the codename for your version (assuming 14.04 LTS, it is "trusty"). 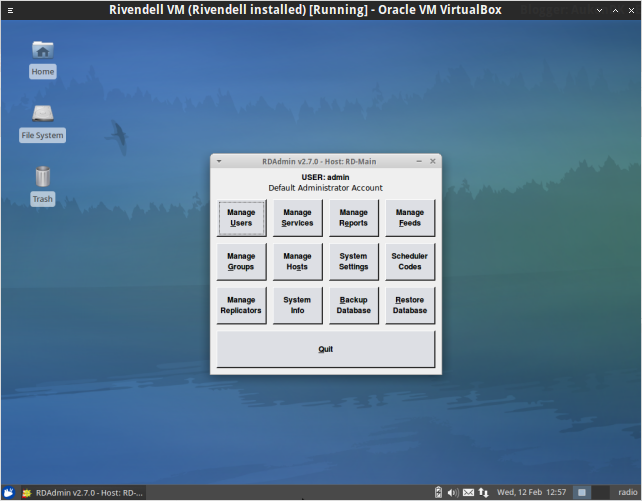 Then continue (skipping step 4 as the key is already installed) and the qt3 libraries should install with Rivendell. 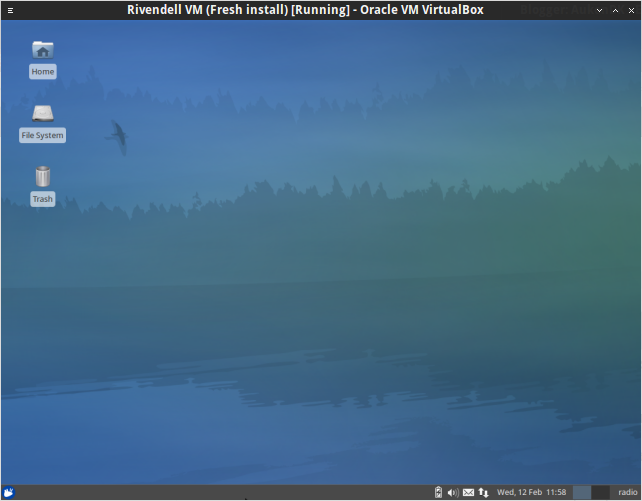 I've not played with Rivendell much on 14.04 but everything else should work the same. Mint 17.2 is based on Ubuntu 14.04 so the above instructions should work. The only change is in step 2 where you add the repository, change the word "precise" to "trusty". I just had this happen to me. My issue was that my root password was too long for the textbox. Just change the MySQL root password to something shorter. 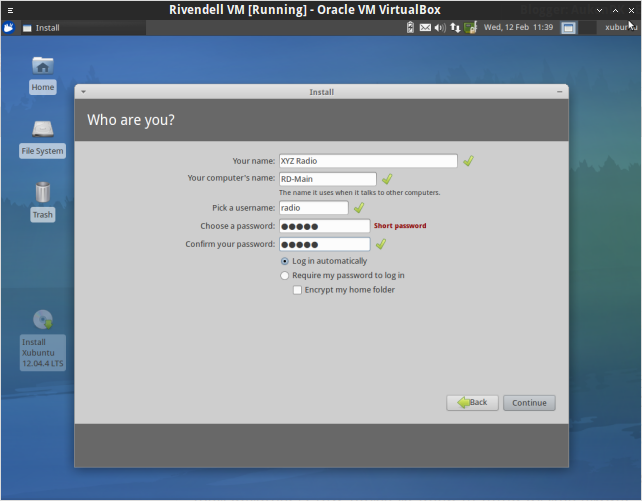 Rivendell only needs it to create the database so you can change it back to something secure after it's finished. Hello, thx 4 the manual. Rivendell is installed on ubuntu 14.04 but i'm having a strange crash. I can import music, listen music in the library, ad music to the jingle panel but when i load a music files into the cards and then want to play the just created playlist my computer shut downs rivendell and log out. Anyone how knows what's triggering this behavior? I had something similar on one of my installs, playing anything on the main log in Airplay would lock up the machine but play the whole track. Not tracked down the cause yet but I only use that machine for Library things, not playout. Sorry. This article needs an update for 14.04 but I fear 16.04 will be out before I get around to it. Thanks for good installation guide. 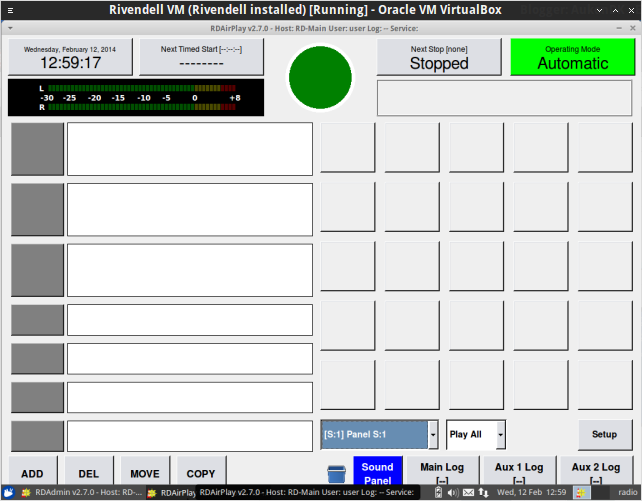 After everything I have a problem with sound – Rivendell can't see any of my sound cards. If I run "sudo rdalsaconfig", it shows RME sound card, but I can't see it in RDAdmin/Hosts/Audio Ports and Audio Resources. ALSA mixer shows that card, it is not muted, I do have sound with that card with other programs (Audacious, Firefox). I don't use PulseAudio. Maybe you have any suggestions that I could try? I searched for an answer, but it seems nothing works as of now.